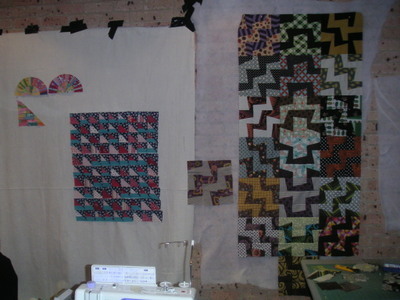 as big or little projects. There are few things as soul restoring as a couple of days away with the gals. 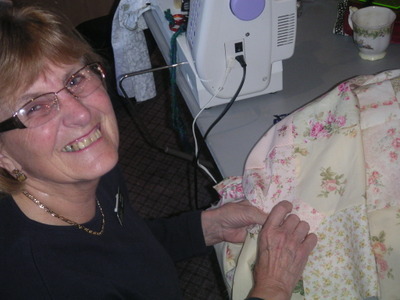 We sewed, ate, drank and were merry from Thursday until Sunday. 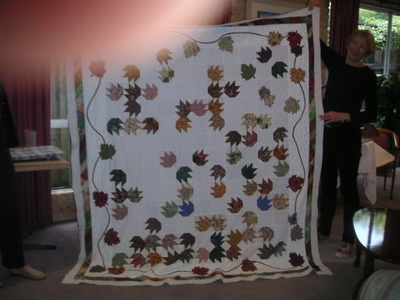 The concentrated effort is worthwhile in the end as things start to take shape and then get finished. 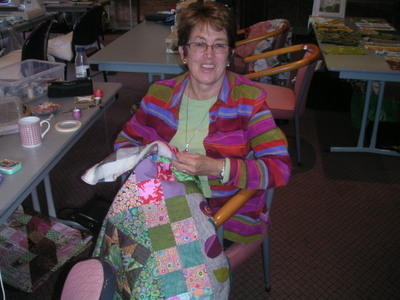 Some of us sat quietly like Vi until their quilt was finished. Isn't it sweet! Some disguised themselves by wearing colors that blended in with their quilts, a phenomenon that we actually see quite often! 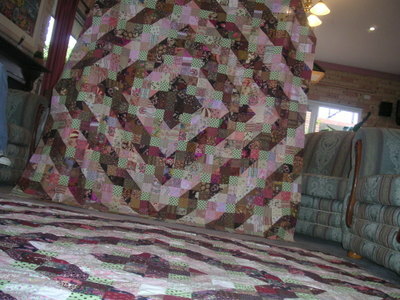 Marie and Florence have been inspired by LIza Prior Lucy's Perkiomen Quilt pattern and have used up what must have been a fair bit of their pink and brown fabrics...highlighted by a pale green spot. 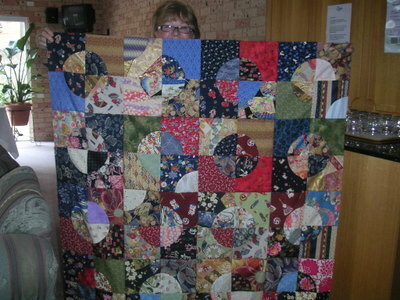 This quilt got its final border after visiting Hunters Hill quilting retreats three times!!! It looks like we just sewed and sewed until we could sew no more but every once in a while we just turned up the volume and sang along to Jason Mraz...I'm Yours! "...can't you just hear Sarah now! 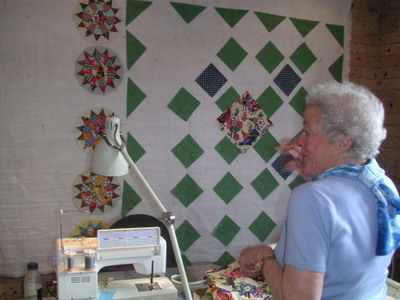 It can be confronting having so many quilters in the room at once. There were lots of helpful comments about placement of colors and blocks, all taken in good nature, particularly considering the source! Thanks for sharing all your Lovely pics looks like a Great Time was had by all. Oh my! 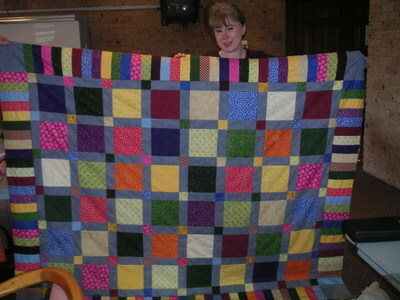 So many wonderful quilts! I love love love the big one in the first picture. The one with the thick squiggly (for lack of a better word. lol) lines in it. 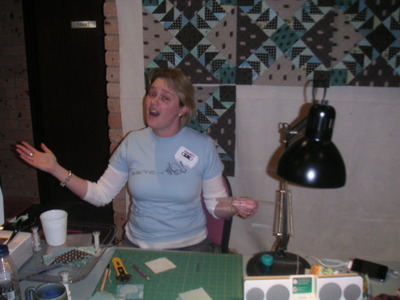 Is that one of your patterns?? Oh what fun! I am looking forward to a retreat in October, and reading your post makes me even more excited! 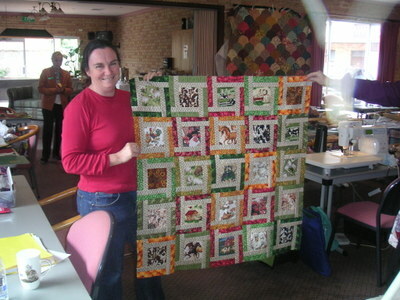 It's wonderful to have quilting buddies, glad that you had a good time and thanks for sharing the photos of inspiration. 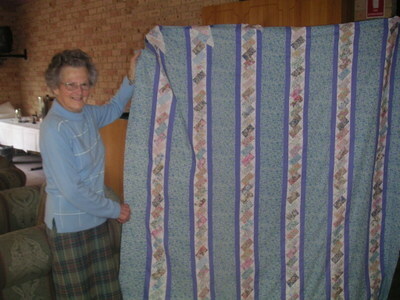 I, too, love the large quilt in the first photo, pattern or book , maybe?